One of the most common wardrobe plagues that you can face is dingy whites. While chlorine bleach can play a significant role in keeping your white shirts and clothes white, it can’t accomplish the task alone. For optimal results, you will need to know how to wash white clothes differently than the rest of your dirty laundry. 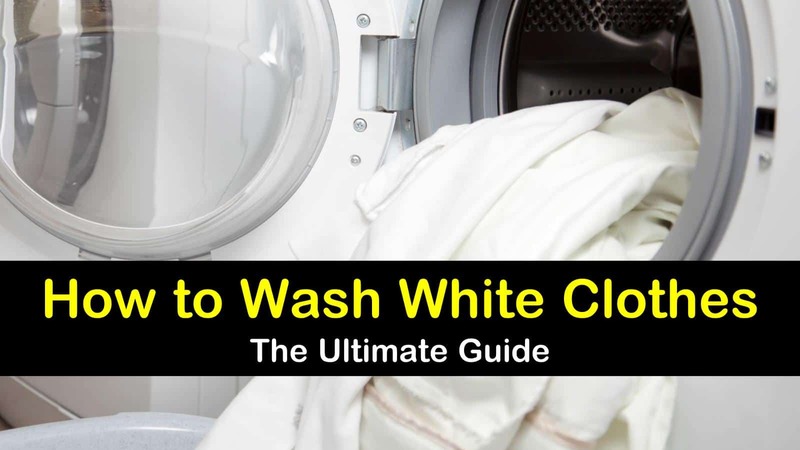 Learn how to wash white clothes with this ultimate guide to white-washing basics and bring the brilliance back to all your white clothes. Your white clothes tend to be more prone to becoming discolored, stained, and yellowed when compared to your colored clothing and can be somewhat challenging to keep white. Fortunately, with the proper care and attention, you can keep all your white fabrics, white and bright, without decreasing their quality and appearance. What Temperature Do You Wash White Clothes In? What Products Can You Use to Wash Your Whites? By following basic sorting techniques, using the right laundry products, and washing your whites in the correct water temperature, you can ensure your whites will be as bright as the day you bought them. You whites come in many different forms, from regular and delicate to sheets and towels, and require different techniques to keep them looking great. The one thing that all these different white fabrics have in common is their tendency to look dull and dingy over time. Learn the best techniques for washing and bleaching your whites to help them stay white. The very first step necessary for washing white clothes is to separating laundry correctly. One question that tends to get asked is if you can wash white clothes with colors? The answer is no. You want to separate your white clothes from your colored garments to avoid colors from transferring to your white fabrics and leaving them with stains. Next, you want to separate white clothes with colors from those that are all white. Never consider washing black clothes with whites. Doing this will help to prevent the colors, no matter how small the area, from bleeding onto your all-white clothes. Color isn’t the only consideration that you need to take when sorting your clothes. You need to determine if the item can be washed and what temperature. You also need to look at the care label to see if you can clean it with bleach. Depending on the type of clothing it is, regular or delicate, you’ll need to sort based on which wash cycle is best; regular, permanent press, or gentle. You’ll also need to sort your whites according to how dirty they are; you don’t want the dirt from your white work shirt transferring to your nearly perfect white t-shirt. Once you’ve sorted your laundry by color, temperature, wash cycle, and dirtiness level, you’ll most likely have a large pile of slightly soiled, machine-washable clothing that can be washed on permanent press. In an attempt to save energy, many have abandoned hot water when we wash clothes. However, while this is better for the environment, it isn’t always good for your clothes, or your health, since a hot water temperature is what kills the bacteria that is left in your washer. When it comes to cleaning and keeping your whites, white, the hotter the water temperature, the better, which means you should use the hottest water recommended for the kind of material. However, not all your fabrics should be washed on hot because they could shrink or become misshapen. The following is a general guide to what temperature water to use with your whites. Hot water for filthy clothes and to disinfect washcloths, bath towels, dish towels, and bedding. Warm water for synthetic fabrics, natural, and manmade materials, and moderately soiled garment. Cold water for delicate fabrics, clothes stains with blood, wine, or coffee, and slightly soiled items. When it comes to the rinse cycle, you can use cold water for any type and color of clothing. Not only will cold water help to reduce the energy you use for each load by up to one-third, but it will also help to minimize wrinkling in your synthetic and permanent-press items. The other thing that you need to consider when washing clothes is what you should or shouldn’t add to the water. To start with, you want to add your regular laundry detergent to the load. If you can find one that contains oxygen bleach even better. However, if you see that your regular soap isn’t doing the best job whitening your clothes, you may have to turn to another product. While washing white clothes with bleach is quite commonly used to whiten clothes, it can come with its drawbacks. First, chlorine bleach can be extremely toxic and can irritate sensitive skin. Secondly, if you use too much bleach, it can end up causing your clothes to turn a bit gray or yellow, so your measurements must be precise. Lastly, both oxygen and chlorine bleaches will weaken fabrics over time, which will lead them to develop holes, tears, and fraying. If you want to use an alternative to bleach, which doesn’t have the drawbacks, there are a few options that you can choose. You can boost your laundry detergent’s performance by adding a cup of baking soda or ½ a cup borax to the wash water. Other alternatives include lemon juice, white vinegar, and hydrogen peroxide, which have gentle whitening qualities. To ensure that any dulling agent residue is stripped from your fabrics, skip the commercial fabric softeners and add a cup of distilled white vinegar to the rinse cycle. As soon as the washing machine stops, transfer your white clothing to the dryer to dry. This will ensure that your whites won’t develop mold or mildew from sitting in the washer for too long. As you place the items in the dryer, inspect them for any remaining stains. If a stain is still visible, keep that item of clothing out of the dryer as the high heat will set the stain making it much harder to remove later on. Dry the clothes according to the care label. Some of your clothing may recommend a particular setting or require you to “lay flat to dry.” If possible, you should hang all your whites outside in the sun to dry. The sun’s ultraviolet rays have a natural bleaching effect that can help to keep your whites white, plus it’s more cost effective than running your dryer. If you’ve decided to use bleach when washing your whites, you want to be sure to follow the recommended instructions to keep from damaging your clothes. This also goes for hand washing clothes. Chlorine bleach is a potent whitening agent that should only be used on white garments. If you have patterned or multi-colored items that you want to look brighter, use should use one of the bleach alternatives mentioned above in your wash. The first thing you want to do when washing white clothes with bleach is to check the care labels on the items to make sure you can safely use chlorine bleach. If it’s safe to use, then you can start your washing machine with your regular detergent. Then add ¾ cup of chlorine bleach to the water. Next, add the whites to the wash cycle, and launder as usual. If you have washable whites that you can’t use chlorine bleach on, you can use non-chlorine bleach to brighten these items. Non-chlorine bleach uses hydrogen peroxide or oxygen to whiten cotton fabric. To use non-chlorine bleach to brighten your whites, make a solution of the product according to the instructions. Place your items in the solution and soak overnight. The next day, remove the clothing from the solution and place in the washer to launder as usual. Whether you are trying to tackle an unsightly ketchup stain or annoying deodorant stains, you can get them out with the right products and a little bit of elbow grease. Here’s how to make a simple stain remover from everyday household products that will tackle even the toughest stains. Mix the Dawn dish soap with the hydrogen peroxide and place in the container. Slowly start to add the baking soda to the liquid. You want to add just enough to form a semi-liquid paste. Apply the paste to the stain and rub the stain remover into the stain with an old toothbrush. It is essential that you treat both sides of the stain. Let the paste sit for at least an hour, then wash according to the care label. Check the all the clothing before placing them in the dryer to ensure your stain removal efforts were effective. If the stain remains, repeat the stain removal process until the stain is gone. No matter how careful you are during your day, your dress shirts are bound to get dirty. With proper care, your high-quality dress shirts can continue to look great and last for years. Here’s how to care for your dress shirts at home to ensure you can continue to wear them for years. Start by preparing the shirt by unbuttoning all of the buttons. This includes the cuff and collar buttons. If you have any collar stays, be sure to remove them and put them in a safe place. If you have any stains, make sure to pre-treat them with a quality stain remover. To minimize wear on lightweight or fine shirts, be sure to wash them on the delicate cycle. For shirts made from heavier fabric, you can run them through on the normal cycle. Wash your white and light colored shirts in hot water, but dark colored shirts should be washed in cold water to keep them from fading. Wash the shirts in the washing machine and allow the spin cycle to remove most of the excess water. Promptly remove the shirts from the washer and lay flat or hang up to dry. Once the shirts are dry, you can iron them to remove any wrinkles. Everyone has at least one piece of white clothing in their wardrobe. Not only is it a classic color, but it goes with everything. 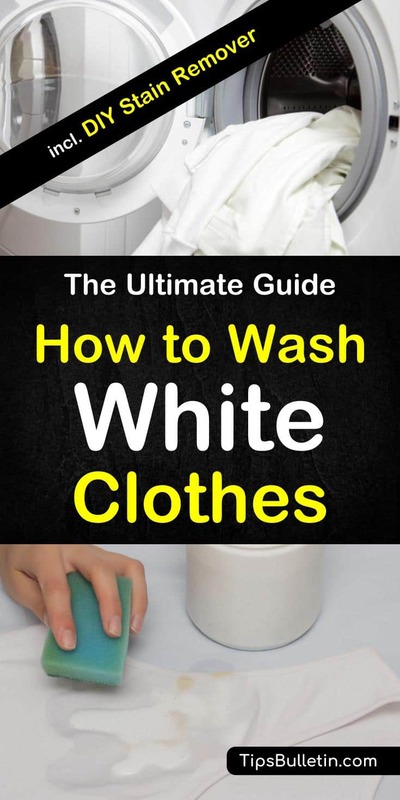 Unfortunately, it can be a challenge to keep your white clothes white. Following this complete guide to washing white garments will not only allow you to get your whites clean but will keep them looking bright. We hope you enjoyed learning how to wash white clothes. If you found the information in these laundry tips useful, please don’t hesitate to share it with your friends and family.